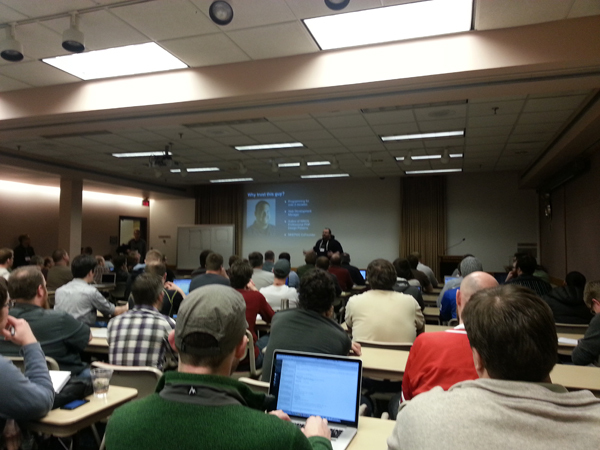 That’s Aaron Saray, a PHP Developer from Milwaukee who gave a riveting presentation about using PHP design patterns and modularization for enterprise applications to a packed room on Saturday afternoon. As a relative newcomer to the world of PHP and computer programming in general, I’d contemplated whether Aaron’s talk might be over my head. After all, he was presenting what seemed like an advanced talk about object oriented programming at the same time as another presentation that offered an introductory look. Afterward, I felt great about my decision. Aaron’s delivery was fast-paced and hilarious and his presentation introduced just enough basic information upfront to help others like me understand the overall concept of the topic before digging deeper into the details. In many ways, the enormous impact of these tradeoffs speaks to the quality of the offerings at this first-year conference. At one point (the last session of day 2), there were four different presentations all running concurrently that I wanted to see. Essentially, I threw a dart and landed on Josh Broton‘s presentation called “Embrace Your Inner Designer” where I saw his hilarious introduction to the “value” of the HTML marquee tag, along with many far more insightful tips and recommendations. Unfortunately, this was at the expense of seeing Chris Hartjes speak about PHP unit testing, Mike Stowe‘s “Introduction to Zend Framework 2”, or Jesse Donat‘s presentation about PHP command line scripting. Essentially, it was a terrific conference and an amazing first-year effort by the aforementioned Mike Stowe and co-collaborator Jonathan Sundquist. I feel fortunate to have finally found my career calling and to live in the backyard of such wonderful programming talent. I’m already looking forward to next year, and I’m optimistic that some tweaks will be made to the scheduling to attendees to catch more of what they want to see.